We believe that all students are key stake holders in their education and the development of the academy. Democracy is a key value which underpins our existence in the UK and which is embedded in the life of the academy. Our academy therefore has an important and growing student leadership and student voice. Our academy is led by a head girl and head boy in year 11 – these went through a rigorous application process, were voted for and interviewed. They are supported in their role by two assistant head girls and two assistant head boys. This small team leads a wider team of senior prefects (Y10 & 11) and junior prefects (Y8&9) – they contribute to leading on strategic vision, to setting an excellent example in and around the academy, support our anti-bullying ambassadors and do weekly duties in the academy. South Shore Academy Student Leadership Team also meets regularly in working groups to identify strengths and areas for development in strategic areas. They work closely with our Student Voice groups who represent the thoughts, needs and ideas from the whole student population. This gives students a meaningful voice in the academy and allows them to drive the changes taking place in their academy to improve their education. 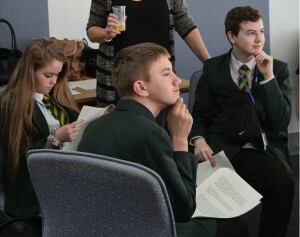 Student Leaders will also have unique opportunities to develop their leadership skills, their teamwork and employability skills as they work together as a large team to lead the academy forward. Student Voice is about empowerment of pupils to enable them to be engaged and involved in the learning process. Any student in any classroom in any year, has a voice that should be heard in school. Student Voice allows students to share who they are, what they believe, and why they believe what they do with their peers, parents, teachers, and their entire school. The United Nations Convention on the Rights of the Child (UNCRC) is an international agreement that protects the human rights of children under the age of 18. The basis for pupil voice is to be found in Article 12 of the UNCRC, which sets out the right of children and young people to express an opinion and to have that opinion taken into account when decisions are being made on any matter that affects them. This Article is seen as particularly important, in that it is an enabling right, empowering and supporting children and young people to access broader rights under the UNCRC. South Shore Academy wants all children and young people to have opportunities to actively participate in decision-making at academy level and at local, regional and national levels in the UK. Being part of and contributing to the Student Voice is therefore excellent preparation for involvement with student unions at university and develops leadership and employability skills. At South Shore Academy we care about what the students think and take time to listen to their views. Student Voice is engaged in dozens of ways in classrooms and schools such as: School Voice Working Groups, Student Leaders in Year 8-11, use suggestion boxes, form forums, student voice questionnaires, use of student voice in lessons to enhance learning. At South Shore Academy we value young people and give them ownership of their learning and opportunities to make a difference.